This months blog post comes from Garage Storage Solutions. Garage Storage Solutions, LLC is a garage storage and organization company serving the Denver area’s homeowners with solutions and tips for an organized garage. One of the most common barriers to a project is the feeling of being overwhelmed. When we are overwhelmed, we get anxious and start dreading the task at hand. That’s when we quit. It’s hard to get past this feeling once it starts, and it’s even harder to restart a project we put down once we got overwhelmed. Here are some ideas to avoid feeling overwhelmed when you take on a big organizing and de-cluttering project. First, remember to take it slowly. When you walk into a room filled with “stuff,” you may have the tendency to think, “I’ll never get this done! This is impossible!” The truth is, these thoughts usually lead to you walking away from the room and never even starting. Instead, tell yourself that you CAN do it, and you can do it one box or shelf at a time! It’s important to not overwhelm yourself by trying to take on a bigger task than what you have time or energy for. Set a timer for a small chunk of time; 1 to 2 hours is best, or whatever works best for you. If you feel good enough to continue after that, then do it, but if not, pick another day/time to continue. 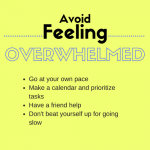 To help you ‘go slow’ and avoid overwhelming yourself, it also helps to set time aside on your calendar. Decide how much you can realistically set aside each day without over-stressing yourself and then prioritize what needs to be done first, second, and so on. When you have a schedule that you can look at and even mark off as you go, you can see your progress, and that will encourage you to continue. Having this visual schedule will keep you on a progressive journey to completion. Another great tool is to enlist the help of others. Having a family friend or a Professional Organizer work with you, or just having somebody to report to and be accountable to has been a proven method to help in a lot of different situations, from children doing their homework to trying to lose weight! Having someone working with you will help keep you on track if the task does get hard and you start to feel like giving up. Finally, remember that sometimes we just have ‘off’ days. Some days we just need a break, or are too busy to get around to the project.. If you get behind, or if you just need a break, don’t beat yourself up about it! Don’t feel that just because you missed out on a single task the rest of the day or week is ruined. Just move that task to a different day and try again. De-cluttering and organizing can be a big, sometimes scary, process! Avoid getting overwhelmed and bringing the whole project to a halt, with the above tips. You will be glad to have a plan and will feel a lot better about getting the chaos under control again.